Yesterday, I showed you how Dell irresponsibly ships tiny flash drives in gigantic boxes, giving the finger to the environment. 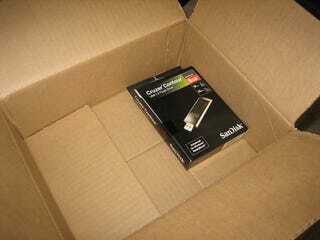 Well, Dell isn't the only offender when it comes to wasteful shipping habits. Above, reader Paul shows us how WalMart.com decided to ship a flash drive to him. And NewEgg? It's even worse. Reader Mick received five ink cartridges in five different packages, most of which were ludicrously large for the single tiny box within. This is such an idiotically easy problem to solve that would have a huge impact on the environment. Let's start being responsible, online retailers. It's in your hands. Have you received an irresponsibly-packed item from an online retailer? Snap a picture and send it to me at adam@gizmodo.com and I'll help you shame them publicly.